you know, it's like a marathon of stuff to be grateful for. 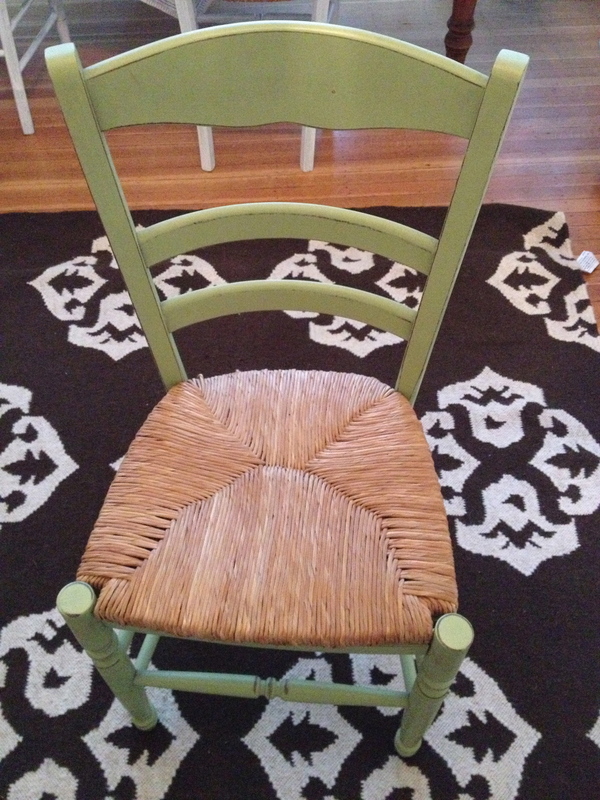 I have had some green chairs from Pottery Barn for a long time. How long? Maybe like 15 years or something. Anyway, I used to use a lot of green and what you find when you use a lot of one color, is that it is a sure way to begin a life-long hatred for said color. And so it is with my green chairs. Now I also use a lot of white. Impractical, silly for a family with a dog, or a teenager, but there it is. And I never get sick of it. So, throw out my previous statement, because I’m fairly certain I will be a “white” girl forever and ever, and if I manage to get to heaven, the traditional heaven, I’ll be in a good place–decorated in white clouds. Lovely taste they have up there. Anwyay, yesterday I decided to do a little down and dirty painting of the green chairs. I should also mention that my idea of the “perfect” white chair is one that is old, with chipped paint and a story to tell. I have a couple, but the problem with these guys is that they break (hopefully, nobody is actually sitting in them when they do this–.so far, so good). I had wanted to get to the mecca of white chairs and everything else that is old and cool and just waiting to be bargained for–Brimfiled, the largest flear market in the world–last week, but with my sturdy to do list spanning 10,000 miles, I couldn’t drive the hour and half to scavenge for white chairs at the over 6,000 dealers just waiting to unload their wares. Oh the agony….. So, instead, I went to the hardware store, got myself some Benjamin Moore white paint, bought the suggested primer, which I knew I would not use, threw down a tarp in the backyard and proceeded to basically paint myself white (the chair managed to get a little white on it, too). I am not fastidious. My A.D.D. takes over when I’m doing something like this, and I get a little impulsive. So, I took the primer out of the bag and let it watch me paint right on the chair. I know I was supposed to use it for the best coverage, but I didn’t. 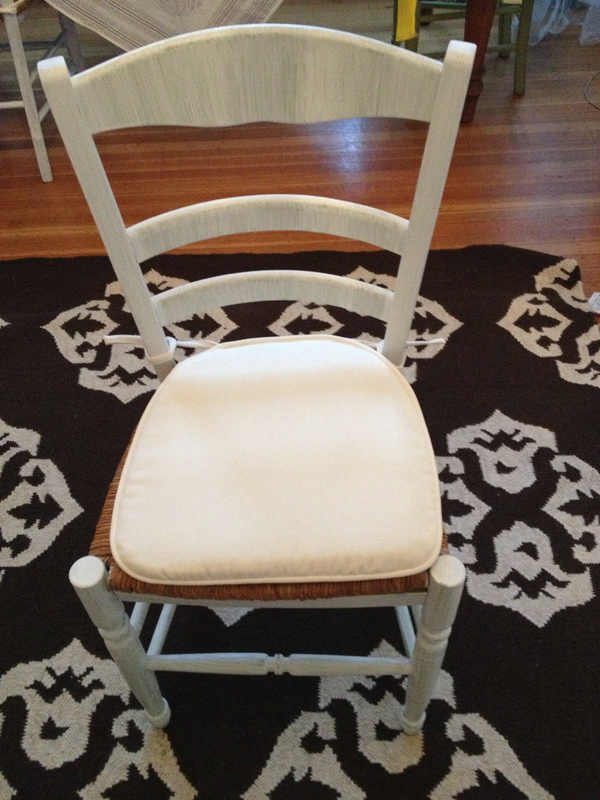 Here’s where the chipped paint white chair love comes in–I don’t care if something looks perfect. I am all about the imperfect. So, for me, even though you can see the brush strokes and some green peeking through on the chair, that would drive somebody else to have a small stroke, I love it. It’s basically what I was going for! So, for today, my gratitude goes to….da, da, da, DAAAAAAA– paint. Transformative, awesome, change-your-whole-mood-in-a-minute paint. If only everything was so easy to change. The new look is fabulous! A great “faux” textured look. Love it!